Our fully furnished and tastefully decorated cedar chalet is situated in a gated mountainside community. This vacation chalet has a gas log fireplace, oak floors and pine tongue-and-groove cathedral ceilings. Year-round access, open decks, and beautiful mountain views makes this a perfect vacation getaway. Motorcycle friendly with paved roads and a 2 car garage. 15 minutes to historic downtown Murphy and 20 minutes to Blairsville GA. Close to lakes for enjoying water sports. 45 minutes from the NOC and 30 minutes from the Ocoee River for whitewater rafting. Within 20 minutes from 2 golf courses. The John C. Campbell Folk School is 5 miles away. No smoking inside the chalet and no pets. Overall great place to stay, beautiful porch, deer in the morning and the garage was a big time bonus as it rained quite a bit. Very nicely decorated inside, would stay there again! 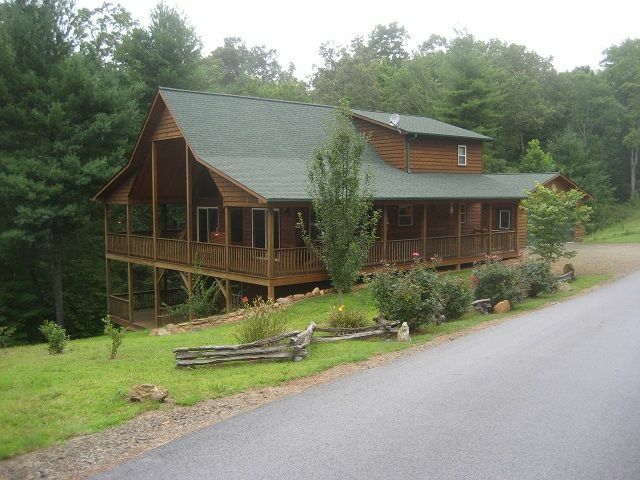 Well appointed and perfectly situated cabin located near Murphy. The owners have done a lovely job with the layout, decor and supplies, which made our holiday retreat a memorable one. Will be recommending to others and would like to return in the future. The chalet was everything it was advertised and more. The owner was very informative prior to our visit. The information book inside contained all of the information you needed for your stay and suggestions on places to visit. The chalet was very well stocked and very comfortable. The views of the mountains were beautiful. The chalet made for a very relaxing vacation. Comfy, spacious house near folk school. Very comfortable spacious house in quite neighborhood and only 4 miles from John C Campbell Folk School. Everything we needed was stocked up. Owner was very easy to work with. What a beautiful view! A great vacation in a great home! This is in a gated community that is heavily wooded with beautiful homes. Serenity was ideal! The furnishings are wonderful, the kitchen is well equipped, and it was great to garage our car. The various folks we met in our walks were friendly and provided good tips for car trips. The weather was a bit cold for us, so we didn’t make use of the inviting wraparound deck. Hope to return in early fall so we can enjoy the deck and the beautiful view from the outside! Heidi was wonderful and provided a great notebook about the area with lots of information . This is a beautiful home and we really loved it from the instant we entered. We highly recommend it. This was our second visit, and the place was just as wonderful and relaxing as our first stay in February. Everything was clean, comfortable, and helped us have a fun yet relaxing time in the NC mountains! Can’t wait for our next trip and another stay at Serenity!